I have been meeting my self-imposed deadline of finishing one bunny block per week. 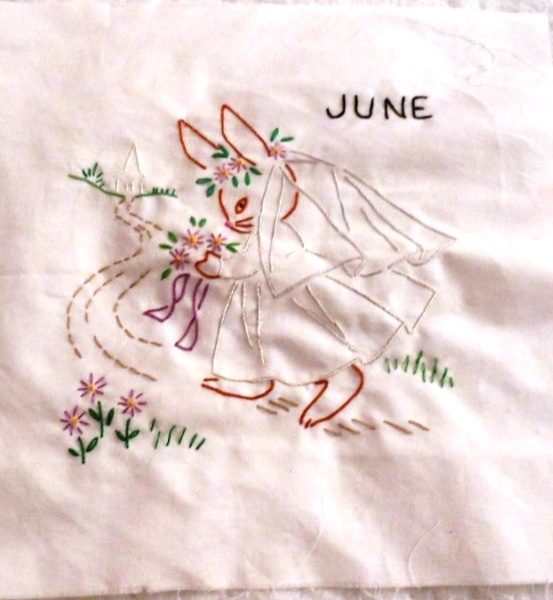 The June one was a little out of sync, parts of the design had not transferred well, due to my poor ironing skills, and I needed to do some tracing in a window on a sunny day. I finally got that done and got this block done by the end of last Sunday. (Good thing there was some golf to watch/listen to.) The problem with this block is the rabbit-bride had to be wearing a white dress, which is not going to show up really well on the completed quilt. I don’t suppose I had to make the church white but it seemed like the thing to do. I did make the veil a light silver color, so maybe it will show up a bit differently. I finished the October blockthe week before, not quite on deadline, but by the end of Tuesday. I am behind on the one for this week, but hopefully will have some time on Sunday. I have a business trip tomorrow, and am taking my Camp Loopy project, the color affection shawl (picture below.) 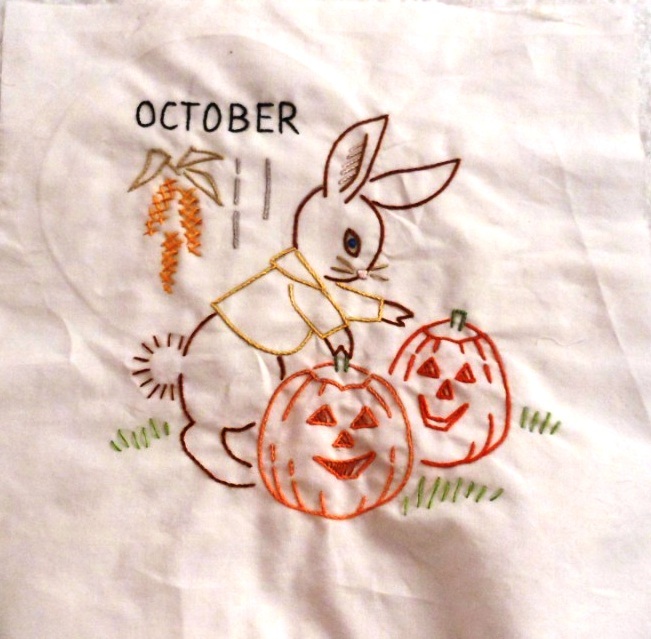 The June one also had much less detail than this October one had. This one was kind of a pain, but it looks nice, I guess. Now I just have November and December left. Here is the color affection shawl. Thanks to my friend Judy, I am doing it on the size of needles recommended. Usually I go down two sizes, but she is also a loose knitter, and she is knitting it on a size up from the recommended size 6 needles. 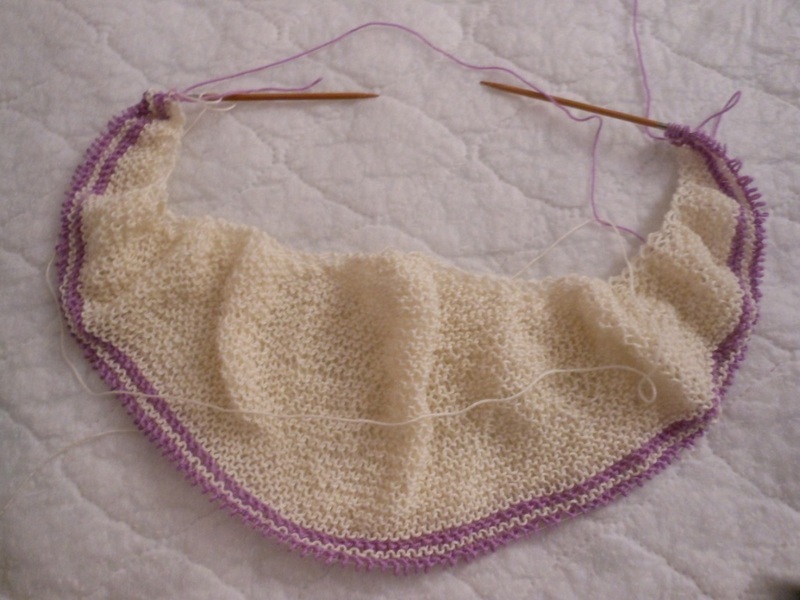 I am hoping to get to the end of the 2nd section (lavender and cream stripes) by the time I get home from my trip, and carpooling to a meeting on Friday. If I get enough knitting time on the airplane, maybe I can take embroidery on the trip to the meeting. I can’t just sit in a car and ride, it is very difficult for me. I have to be reading, or knitting, or embroidering. Usually I don’t get carsick. Usually. 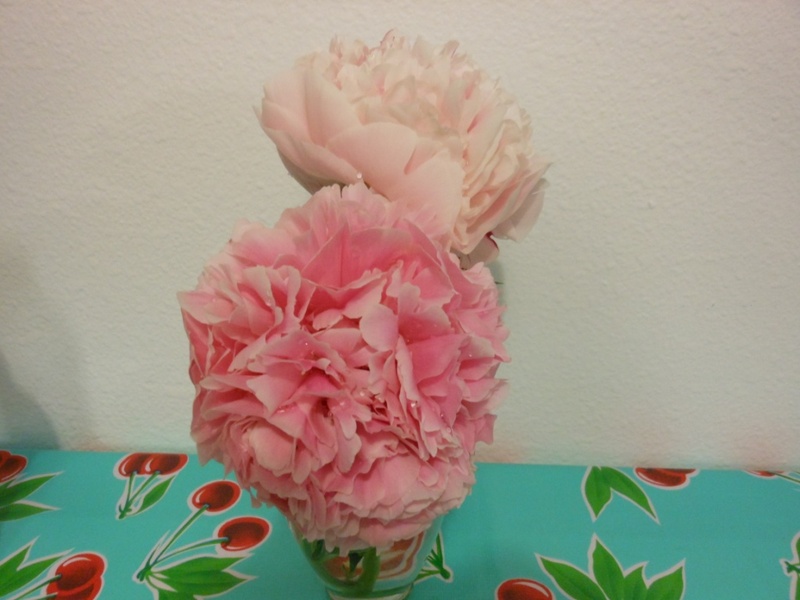 I watered the flowers tonight and one of the peonies lopped over and bent its stem, so I felt the need to bring it in for a bouquet. 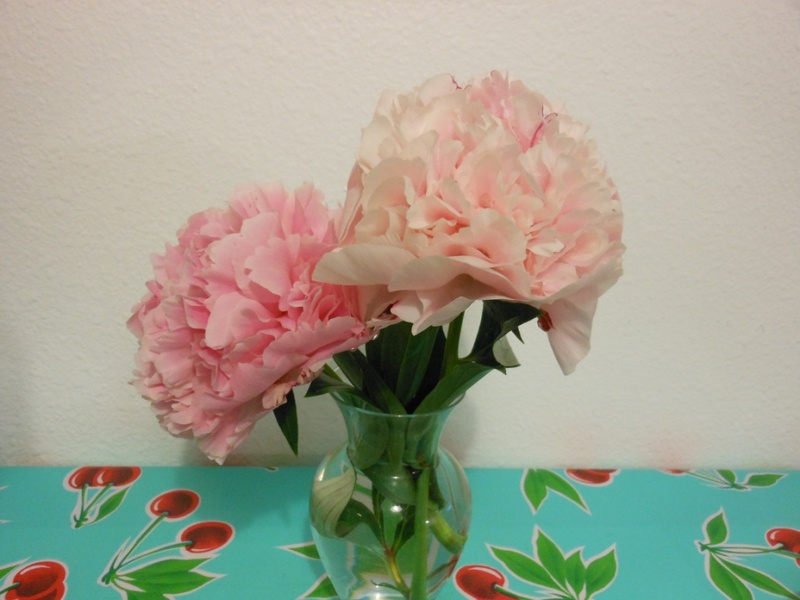 Peonies are in my top five favorite flowers, and they are blooming happily this year. I am very tempted to convert most of the upper garden to peonies. It is half peonies and bleeding hearts anyway. Maybe I will put in an additional row this year. Can’t have too many peonies, in my opinion. After a stressful day at work and coming home to swamp cooler problems, I declared it to be a night to sit in the driveway and have a drink and watch the sun go down. It was great. I will be making that declaration more often this summer. This entry was posted in Crafting, Embroidery, Flowers, Knitting by glenderella. Bookmark the permalink.